We’d love your help. 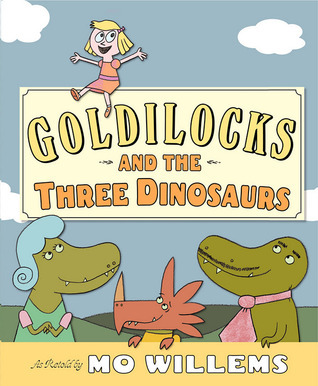 Let us know what’s wrong with this preview of Goldilocks and the Three Dinosaurs by Mo Willems. One day--for no particular reason--they decided to tidy up their house, make the beds, and prepare pudding of varying temperatures. And then--for no particular reason--they decided to go...someplace else. They were definitely NOT se Once upon a time, there were three hungry Dinosaurs: Papa Dinosaur, Mama Dinosaur . . . and a Dinosaur who happened to be visiting from Norway. To ask other readers questions about Goldilocks and the Three Dinosaurs, please sign up. how do i start to read the book? Eòghann Adrian Robert Millard I was actually wondering that too! I'm just really stressed I don't know how to.I was looking forward to reading this. My children love the books about grumpy Pigeon (e.g. Don't let the Pigeon drive the bus), but also the books about the two best friends Elephant and Piggy by Mo Willems. Naturally, we have sought more books by the same author. 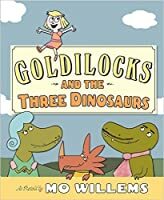 Goldilocks and the Three Dinosaurs is a funny (mostly sarcastic really) version of the classical tale of Goldilocks and the Three Bears. This time Goldilocks has made a mistake and she doesn't visit/trespass the house of the cute bear family, but the house or three hungry d My children love the books about grumpy Pigeon (e.g. Don't let the Pigeon drive the bus), but also the books about the two best friends Elephant and Piggy by Mo Willems. Naturally, we have sought more books by the same author. 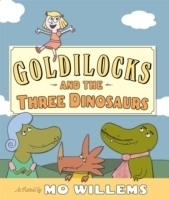 Goldilocks and the Three Dinosaurs is a funny (mostly sarcastic really) version of the classical tale of Goldilocks and the Three Bears. This time Goldilocks has made a mistake and she doesn't visit/trespass the house of the cute bear family, but the house or three hungry dinosaurs who may or may not have set a trap. We love Mo Willems. His books are so humorous, and the illustrations are so clever and fun. We love this snarky version of the classic Goldilocks And The Three Bears story. The narrative is silly, but entertaining and the illustrations are colorful and cartoonish. We enjoyed reading this book together, and our girls loved the endpages with the listing of different titles, like "Goldilocks and the Three Squirrels," "Goldilocks and the Three Clams," "Goldilocks and the Three Red Herring," "Goldilo We love Mo Willems. His books are so humorous, and the illustrations are so clever and fun. We love this snarky version of the classic Goldilocks And The Three Bears story. The narrative is silly, but entertaining and the illustrations are colorful and cartoonish. We enjoyed reading this book together, and our girls loved the endpages with the listing of different titles, like "Goldilocks and the Three Squirrels," "Goldilocks and the Three Clams," "Goldilocks and the Three Red Herring," "Goldilocks and the Three Major Networks," and "Goldilocks and the Three Foot-Long Hoagies." It kept us laughing for quite a long time. Oh for god's sake. YET ANOTHER funny and fantastic and understated and overstated book from Mo Willems. I am beginning to think that if he did an illustrated retelling of, I don't know, The Giving Tree or Twilight or 50 Shades of Gray I would like even THAT. With this book, he had me even before the story began, at endpapers decorated with a hundred scratched-out titles: Goldilocks and the Three Dentists; Goldilocks and the Three Goats. Yup. When you find yourself laughing out loud at the endpaper Oh for god's sake. YET ANOTHER funny and fantastic and understated and overstated book from Mo Willems. I am beginning to think that if he did an illustrated retelling of, I don't know, The Giving Tree or Twilight or 50 Shades of Gray I would like even THAT. Mo Willems’ once again writes a delightful children’s book infused with.... attempted murder, dark humor and subverted expectations?? I reverence Mo Willems, but even a great writer sometimes lays an egg and this to me is his. It tries too hard. It's sort of like something a parent might tell a child if they wanted to retell a classic known story and have the child going "No, Daddy, THAT'S not how it goes". Once again Mo Willems has a winner in this one! A story both my 5-yr-old and twin 2-yr-olds could get into, the fun pictures and unusual twist to Goldilocks had us all laughing. A solid level 2 reading book, if you're looking for one, or just a great story to read out loud to your children, to ensure early reader enjoyment. I highly recommend this author if you're looking for new books to read to your kids! Recommends it for: Mo Willems fans!!! These are the books that I had read from the creative mind of Mo Willems and I will admit that I had enjoyed almost everything that Mo Willems has written over the years! Well, I just read Mo Willems’ most recent children’s book and that is called “Goldilocks and the Three Dinosaurs” and it is definitely one story that every children and adult will enjoy for many years! Once upon a time, there were three dinosaurs (a Papa Dinosaur, a Mama Dinosaur and some Dinosaur who was visiting from Norway) and one day (for no reason), they decided to make three bowls of chocolate pudding at varying temperatures and go…someplace else. They were definitely NOT doing this to set up a trap for an unsupervised little girl who happens to come along to their house. So, when Goldilocks approaches their house, she will be in for a big surprise! Mo Willems’ illustrations are as usual hilarious to look at as the three dinosaurs look cartoony with their long snouts and small round eyes and I loved the fact that both the Mama and Papa dinosaur were green while the Norwegian dinosaur was red. I also loved the illustrations of Goldilocks herself as she has short blond hair and large round eyes that makes her look so oblivious to anything happening around her. Overall, “Goldilocks and the Three Dinosaurs” is a truly brilliant retelling of the classic fairy tale and children everywhere will definitely re-read this book over and over again for many years! The story starts out with a mama and papa dinosaur and then "some other dinosaur who happened to be visiting from Norway" and for no particular reason, they make up their beds, position their chairs and make three bowls of chocolate pudding at different temperatures-because "Chocolate-filled-little-girl-bonbons" are Yummy! To make a long story short, they are expecting Goldilocks to visit, fill her with chocolate, hence the yummy bonbon, and have her fall asleep! Goldilocks visits and then realizes it's a trap and then leaves out the back door. The story ends with a happy ending (for Goldilocks) and a disappointing ending (for the dinosaurs). Willems gives readers, and dinosaurs, some good advice at the end, first, "If you ever find yourself in the wrong story, leave", second, if you are a dinosaur "Lock the back door"! Mo Willems' new spin on the classic Goldilocks and the Three Bears does not disappoint! I was so excited to receive my copy in the mail I read it right away, laughing all the way through it! When my 3rd & 4th Grader saw it they begged to have it added to our bedtime reading along with the chapter books in which we are currently engrossed. Goldilocks and the Three Dinosaurs has the wonderful tongue-in-cheek humor of the Elephant & Piggie books (my favorite of all Willems' work! ): when Gold Mo Willems' new spin on the classic Goldilocks and the Three Bears does not disappoint! I was so excited to receive my copy in the mail I read it right away, laughing all the way through it! When my 3rd & 4th Grader saw it they begged to have it added to our bedtime reading along with the chapter books in which we are currently engrossed. Goldilocks and the Three Dinosaurs has the wonderful tongue-in-cheek humor of the Elephant & Piggie books (my favorite of all Willems' work! ): when Goldilocks stops to think for a minute the author points out that is longer than she usually takes for either. 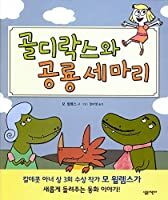 In this version Papa, Mama and the visiting Dinosaur from Norway already know the story of Goldilocks and the Three Bears. They use the fairy tale as a blueprint to set a trap for an unsuspecting, "poorly supervised" little girl, plotting to fill her with chocolate pudding and then eat her. The illustrations of Goldilocks literally diving into the bowls of chocolate pudding delighted my 8-year-old; all the chairs are "too tall" since they are for dinosaurs; and Goldilocks never makes it all the way to the beds. There are two delightfully silly morals to the story--one for Goldilocks and one for the dinosaurs. I highly recommend Mo Willems' latest great contribution to children's literature for ALL ages. Older readers (including adults) will belly-chuckle at the slightly more ascerbic humor that runs parallel just below the surface of the silliness that younger readers will devour in the same way as Elephant & Piggie, Pigeon and Knuffle Bunny and the more recent Hooray for Amanda and Her Alligator! If I ever win the lottery, you can bet that my home library will be stocked with every single Willems book. Another amusing retelling with a twist. I'm amused that Golilocks resembles Trixie from Knuffle Bunny Free: An Unexpected Diversion. Remember: don't skip the endpapers of a Willems book, there's always at least one reward there, and this time there are many. "Goldilocks and the Three Dinosaurs" is a version of Goldilocks, retold by Mo Willems. That is almost a guarantee that the book will be humorous and delight children, young and old! Five stars mostly for the quality of the audience. But it actually was a pretty funny take on the three bears and it had dinosaurs. A humorous reimagining of a classic. Throughout the reading I just kept shaking my head from side to side. Could be a coincidence seeing as I learned how to shake it yesterday, but most likely was me expressing my disapproval at the hacking of classic literature. Most people know the story of Goldilocks and the three bears, but did you know that Goldilocks made a slight detour before finding the bears’ house? That adventure took her to the enormous house of three dinosaurs: Papa Dinosaur, Mama Dinosaur, and some other Dinosaur who happened to be visiting from Norway. Before Goldilocks arrived the dinosaurs made three bowls of chocolate pudding at varying temperatures, for no reason at all, and certainly not because they were imagining the delicious tast Most people know the story of Goldilocks and the three bears, but did you know that Goldilocks made a slight detour before finding the bears’ house? That adventure took her to the enormous house of three dinosaurs: Papa Dinosaur, Mama Dinosaur, and some other Dinosaur who happened to be visiting from Norway. Before Goldilocks arrived the dinosaurs made three bowls of chocolate pudding at varying temperatures, for no reason at all, and certainly not because they were imagining the delicious taste of a chocolate-filled-little-girl-bonbon. Not long after the dinosaurs had gone Someplace Else, which looked a lot like hiding in the woods waiting for an unsuspecting kid to fall into their trap, but wasn’t at all, Goldilocks barged into the Dinosaurs house. Will Goldilocks eat the gigantic bowls of chocolate pudding? Will she figure out she’s in danger before the dinosaurs come home for “chewy-bonbon-time”? Will she make it to the right story? Have I said lately how much I love Mo Willems? If not, or even if I had, let me offer up my love to him here and now. I think Mo is awesome, and from the interviews and readings I have seen with him, he seems to be as awesome of a person as he is a writer. Now on to the picturebook, Goldilocks and the Three Dinosaurs by Mo Willems. Mo takes the classic Goldilocks story and throws it off center. Goldilocks is still a ditzy and self absorbed little girl, but instead of wondering into the home of be Have I said lately how much I love Mo Willems? If not, or even if I had, let me offer up my love to him here and now. I think Mo is awesome, and from the interviews and readings I have seen with him, he seems to be as awesome of a person as he is a writer. Now on to the picturebook, Goldilocks and the Three Dinosaurs by Mo Willems. Mo takes the classic Goldilocks story and throws it off center. Goldilocks is still a ditzy and self absorbed little girl, but instead of wondering into the home of bears she strides into the home of dinosaurs. These dinosaurs, visiting from Norway, make heaps of chocolate pudding and leave for 'somewhere' in order to capture a tasty little morsel to eat. 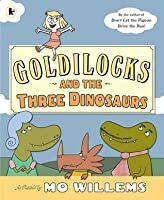 Goldilocks and the Three Dinosaurs offers readers the same illustration styles as we have come to expect from Mo, and some tongue in cheek humor that had me giggling. The dinosaurs hiding in the woods and not so subtly stating their intentions through the book are absolutely perfect. Goldilocks might be greedy, and a poor listener, be she is smart enough to escape being a tasty treat for the dinosaurs. I especially loved the two morals of the story. Goldilocks and readers learn that if you are in the wrong story, get out. The now hungry and disappointing dinosaurs learn to lock their back door so that their meals cannot escape. I highly (oh so highly I cannot express) Goldilocks and the Three Dinosaurs by Mo Willems. I you have yet to discover his work, go immediately to the library (please wait until it is open for the day) and go straight to the children's section in search of him. Do it... trust me. I'm so glad I live in a world where Mo Willems books exist. This is a hilarious parody of the original "Goldilocks and the Three Bears." I remember growing up and hearing my classmates and teachers always talking about all the unrealistic things about Goldilocks. Like why she wasn't being supervised, how did she not know what was going on, who taught her she could just walk into a strangers house, etc. This story keeps the bones of the classic folk tale and adds a funny, more joking twist to it. I think the exaggeration in this book is a good way to revam This is a hilarious parody of the original "Goldilocks and the Three Bears." I remember growing up and hearing my classmates and teachers always talking about all the unrealistic things about Goldilocks. Like why she wasn't being supervised, how did she not know what was going on, who taught her she could just walk into a strangers house, etc. I think the exaggeration in this book is a good way to revamp an old folk tale that most children have already heard. It gets the same points across while also pointing out some of the ridiculousness of the original story. It will keep their attention because it is something they will recognize, but it's silly and maybe a little out of the ordinary. I also found it interesting how the story is centered around different animals than the original but ties it back in with the bears at the very end. This little gem was SO MUCH FUN to share in story time. No surprise, seeing that Mo Willems created it. Okay, first off instead of the usual Papa, Mama, and Baby, there's Papa, Mama, and some other Dinosaur who happened to be visiting from Norway. I love that Papa sports heavy eyebrows and a mustache (can you say Groucho Marx?). I love that Mama has PINK toenails. Secondly, there is NO PORRIDGE! Instead there is CHOCOLATE PUDDING! And the pudding is a TRAP! The fun just goes on and on. Here is Gol This little gem was SO MUCH FUN to share in story time. No surprise, seeing that Mo Willems created it. Here is Goldilock's character description: "a poorly supervised little girl" who "was not the type of little girl who listened to anyone or anything", for starters. A clever, funny book that's sure to be a hit with preschoolers and early elementary school kids. It uses sarcasm as its humorous device, which I don't see much in funny kid's books. Kids will have fun picking up on the changes between this and Goldilocks and the Three Bears. And there's a bonus if they've already read Don't Let the Pigeon Drive the Bus!. I love the sarcasm. So much. This book gets me laughing every time. Thank you Mo Willems for children’s books that appeal to adults. Love him, but this one isn't my favorite. It's adorable and the moral is the best part, and by anyone else this would be a great book but for Mo Willems..meh. In addition to such picture books as Leonardo the Terrible Monster, Edwina the Dinosaur Who Didn’t Know She Was Extinct, and Time to Pee, Mo has created the Elephant and Piggie books, a series of early r #1 New York Times Bestselling author and illustrator Mo Willems is best known for his Caldecott Honor winning picture books Don’t Let the Pigeon Drive the Bus and Knuffle Bunny: a cautionary tale.